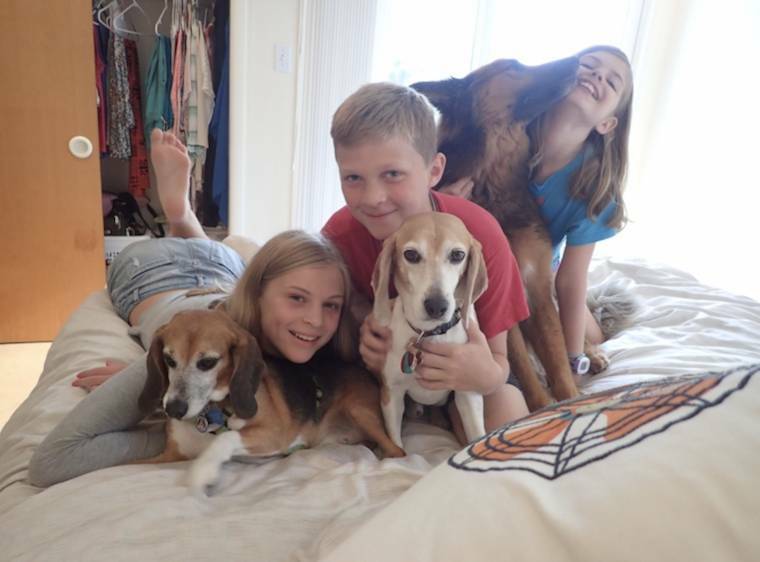 While many Beagle Freedom Project supporters learn about the organization through rescue videos, the Fricke family of Haddonfield, NJ, discovered BFP through one of the rescues himself. In July 2013, Alexander Hamilton, who goes by Hammy, left the laboratory where he spent the first four years of his life and was released as part of BFP’s DC7 group. The Fricke family’s longtime friend, Melanie, brought Hammy back to her home in Washington, DC, and begin fostering him. Just five days later, 10-year-old Lucy and her mom Rachel drove to DC to visit Melanie and found themselves nose-to-nose with a newly freed beagle. As Hammy struggled to adjust to his new surroundings in those early days, displaying signs of anxiety and PTSD, it was Lucy–who also struggled with anxiety–who was able to comfort Hammy—and vice-versa. The following month, just before Melanie adopted Hammy, the pair met the Frickes at their beach house on the Jersey Shore. 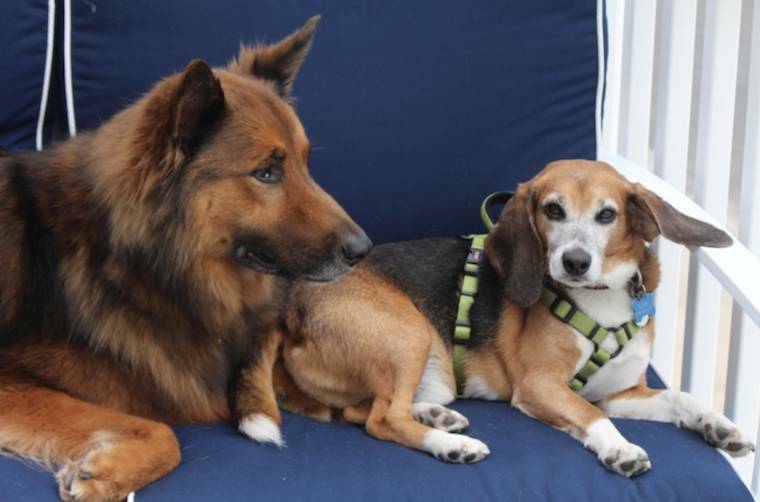 While Hammy was still very frightened and insecure, Lucy continued to help Melanie comfort him, and she developed a beagle bond that only grew stronger over the years. When visiting Hammy in Washington in the next few years, Lucy invited him to burrow down into her sleeping bag at night and joked that she was going to hide him under blankets and beagle-nap him up to New Jersey. But as much as Lucy adored Hammy, she longed for a Hammy of her own. Even though the Fricke home was full of cats, guinea pigs, fish and other animals, Lucy and her brothers, Roland and Roger, had been begging for a dog for years. In December 2016, Rachel and Lucy’s dad, Bryan, finally agreed. 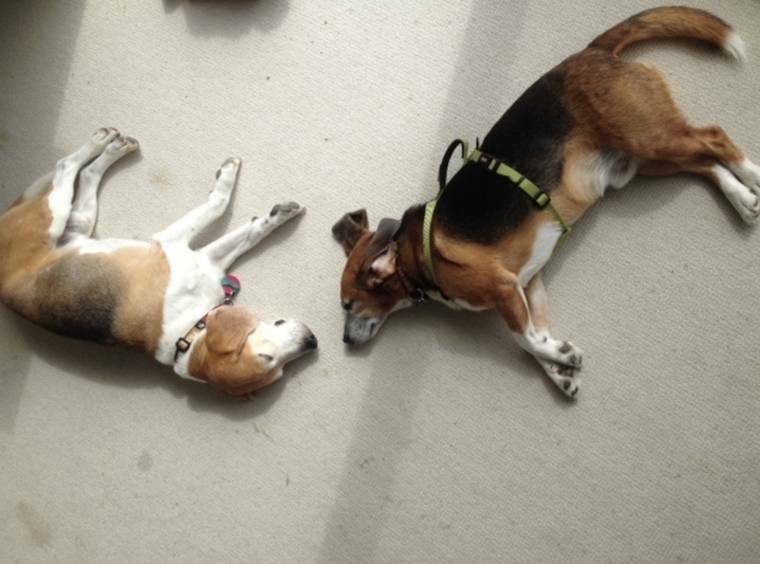 The Frickes knew they didn’t want just any dog; they wanted a Beagle Freedom Project dog. Enter Eddie! Lucy and Rachel drove to Buffalo, NY, on a snowy January weekend to meet Eddie. Eddie had been fostered for several months by Amy and Matt. Like Hammy, he’d had a hard time getting used to life in the free world, and Rachel said Amy and Matt had a difficult job getting Eddie ready for family life with the Frickes. “We have the easy job of just loving him,” she said. And for Lucy, it was love at first sight. From the very first night, Eddie snuggled under Lucy’s covers. Affectionately called a wise old soul because of his gray snout, four-year-old Eddie is so petite his family refers to him as a teacup beagle. Like many beagles, Eddie loves to sleep and often needs to be coaxed out of Lucy’s bed in the morning, only to return to the couch after breakfast. He loves to play with winter hats that have pompoms on top, along with a few stuffed animals he drags through the house. Eddie is a happy boy who willingly greets people and other dogs on his walks. Eddie is a very calming presence for Lucy–and she for him. They seem to understand each other. He helps ease her anxiety by reminding her “sit through it” when she is feeling overwhelmed. They spend a lot of time together snuggled under her covers in bed. Together for a year this January, it feels to the Frickes like he’s been part of their family forever. This summer, Hammy and Eddie met at the beach house, largely indifferent to each other but successful at doing what they do best: sharing Lucy’s love.